We welcome people who are ready to learn about how we grow in Alaska. This includes vegetables and herbs, micro-greens, sprouts, flowers, native plants, potted plants, weeding, watering, pruning, problem solving and winterizing. Experience with maintaining a greenhouse and potted annual flowers is a plus! 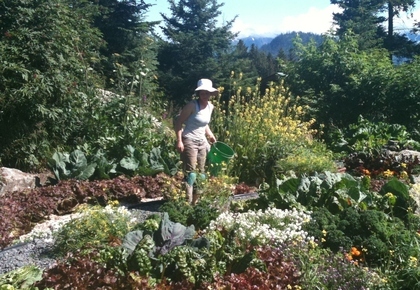 Work as part of the kitchen staff harvesting and prepping the produce and salad mix. This position also includes landscaping and grounds keeping. Be prepared to work outside in all weather conditions. Current ServSafe food handler is required for Alaska. In addition to serving our own adventurous guests, Stillpoint runs a thriving kayak rental and guiding service. We require strong, confident and well-spoken individuals to lead kayaking and hiking day trips, conduct kayak and paddleboard rentals, and track and maintain an extensive recreational equipment inventory. The ability to understand the daily influences of the weather, wind and currents is required, as well as being comfortable with boats and aircraft. The days are especially long and demanding. Our guides must have the passion to stay positive, entertaining and compassionate for the needs of the guests, and continuously foster the ideals of stewardship. Current First Aid/CPR is required. Although each staff member specializes in a specific job, you will also at times assist with housekeeping, gardening, grounds keeping and kitchen duties including serving and dishwashing and ongoing camp chores. This requires the ability to prioritize daily duties with flexibility and readiness to transition between jobs. We welcome staff members who can stay fully focused on the Stillpoint community for their entire contract. We ask you commit to a flexible schedule in compliance with the State of Alaska's wage and hour requirements to include a 12 hour workday. We do not provide vacation, severance or sick pay, retirement benefits nor health insurance beyond workers compensation.